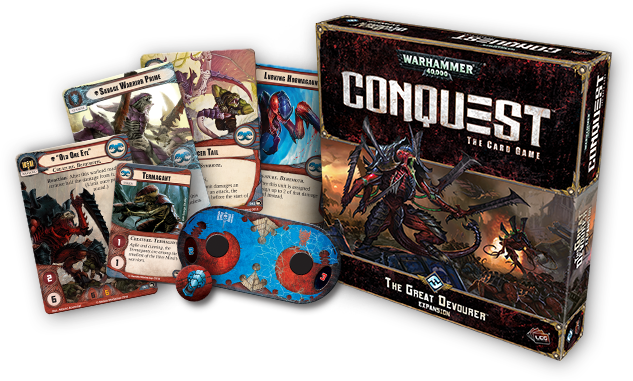 Fantasy Flight Games is proud to announce The Great Devourer, the first deluxe expansion for Warhammer 40,000: Conquest! A new horror approaches – a ravenous species, sweeping through space and filled with an insatiable hunger. This horror is known by many names: the Great Devourer, the Doom of All Things, the Penance of the Elder Gods. To the Imperium, they are the Tyranids – biologically engineered super-predators perfectly adapted to slaughter and harvest new biomass from conquered worlds. Their numbers are legion. Their hunger is as boundless as space itself. Their only goal is to devour and destroy until the galaxy is lifeless and dead. Now, they have come to the Traxis sector. The Great Devourer is the first deluxe expansion for Warhammer 40,000: Conquest, and it introduces a brand-new faction to the game: the Tyranids! Two Tyranids warlords lead these horrific creatures into battle, each offering a very different play style. In addition to these warlords and their signature squads, you’ll find a host of new units, supports, events, and attachments to support the Tyranids, including an entirely new type of unit, the synapse unit. The Tyranids aren’t the only ones to benefit from this expansion, however. Every other faction must make its stand against the Great Devourer in the Traxis sector, and brand-new unique characters help them to battle the Tyranid threat. The Tyranid race wages war very differently than other factions. They have not come to the Traxis sector looking for ancient tech or military strongpoints. They are here for one purpose only – to devour everything within the sector. Because the Tyranids have no interest in diplomacy, they lie outside of the Conquest faction wheel, unable to ally with any other faction. But the Tyranids have plenty of unique adaptations to overcome their lack of allies. In the furor of battle, the Tyranids are commanded by Hive Mind that connects every Tyranid creature. This single coordinating sentience is formed from the billions of individual consciousnesses that make up the Tyranids. Orders are telepathically conveyed to each Tyranid warrior, allowing massive armies to act in complete unison. However, to maintain this telepathic link, certain Tyranid creatures must broadcast the commands of the Hive Mind. In Warhammer 40,000: Conquest, these specialized Tyranids are represented by an entirely new type of unit: the synapse unit. To maintain the Hive Mind’s link with the Tyranid hordes, a single warlord is not enough. Therefore, each Tyranid warlord must be supported by a single synapse unit, which begins the game in play alongside your warlord. What’s more, the Tyranids don’t use the single command dial used by every other faction. Instead, The Great Devourer introduces a unique double command dial, which features two dials – one for the warlord and one for your synapse unit. Each synapse unit offers unique abilities and tactical considerations to the Tyranids. For instance, you may select Savage Warrior Prime (The Great Devourer, 11) as your synapse unit. This synapse unit must commit to a different planet than your warlord, but in some senses, it serves as a secondary warlord. Savage Warrior Prime’s ability reads, “While checking for a battle and determining initiative at this planet, this unit is considered to be a warlord, unless an enemy warlord is at this planet.” With Savage Warrior Prime, you can essentially trigger two battles each turn, allowing the Tyranid forces to swarm and devour all life within the Traxis sector. Five distinct synapse units are included in The Great Devourer, giving you numerous options for customizing any Tyranid deck. The Great Devourer also features Termagants , a new type of token unit for the Tyranids. Termagants are individually weak, but in large numbers Termagants can overwhelm any army. 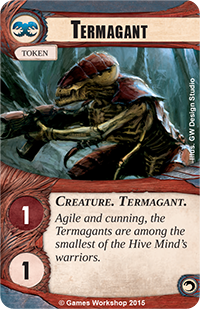 In addition, your Termagants will reap the benefits of the new Hive Mind specialization introduced in this expansion. A specialization is a word or phrase that categorizes an ability and links it (thematically and mechanically) to other similar abilities. 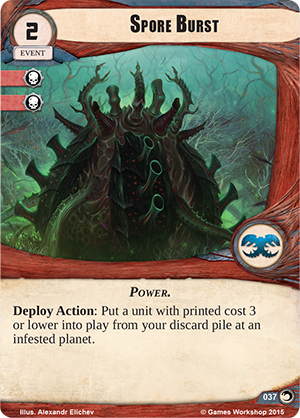 For example, many cards in The Great Devourer possess the Hive Mind specialization, and all abilities with the Hive Mind specialization focus on increasing the power of your Termagant token units. Just one of the units that features the Hive Mind specialization in The Great Devourer is the Termagant Spikers (The Great Devourer, 25). 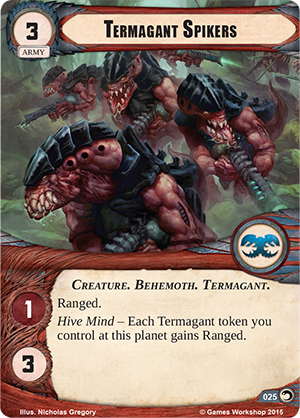 This unit bears the Ranged keyword, but more importantly, its Hive Mind ability gives Ranged to each Termagant token you control at the same planet. Termagants may be easy to pick off, but when they can all fire before your opponent has the chance to pick them off, the damage can quickly stack up. And the Termagant Spikers are just one unit with a Hive Mind ability. When the power of the Hive Mind is keenly focused by more units with Hive Mind abilities, even the lowly Termagants can become terrifying foes. When Tyranids overcome a planet’s defenses, that planet can be forever changed. A planet that has been infested by the Tyranids can provide numerous benefits for a cunning Tyranid warlord as his forces devour the planet’s biomass. 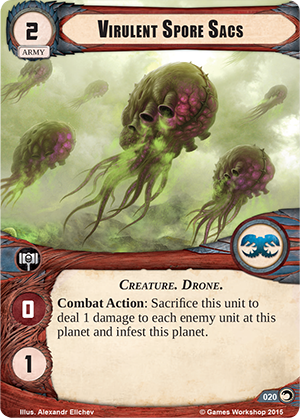 In Warhammer 40,000: Conquest, Tyranid cards such as the Virulent Spore Sacs (The Great Devourer, 48) allow you to infest the planets of the Traxis sector. Infested planets are marked with a special infestation token, and in order to remove this token, a player must win a battle at the infested planet. Each infested planet provides critical advantages to the advancing Tyranid hordes. 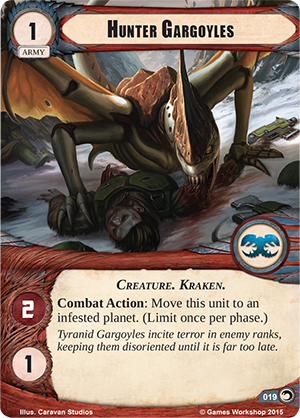 Indeed, many Tyranid cards become even more powerful when deployed to an infested planets. For example, as a Combat Action, you can move the Hunter Gargoyles (The Great Devourer, 19) to any infested planet. Whether you use this ability to keep the Hunter Gargoyles safe or launch them into battle at any time during the combat phase, this ability gives them unparalleled mobility. Alternatively, Spore Burst (The Great Devourer, 37) offers you a way to restore Tyranid units to life. During the deployment phase, you can play Spore Burst to put a unit with printed cost three or lower into play from your discard pile at any infested planet. By infesting key planets throughout the Traxis sector, you can ensure that nowhere is safe from the influence of the Tyranids. The Tyranids are not the only faction to receive powerful new cards in The Great Devourer. 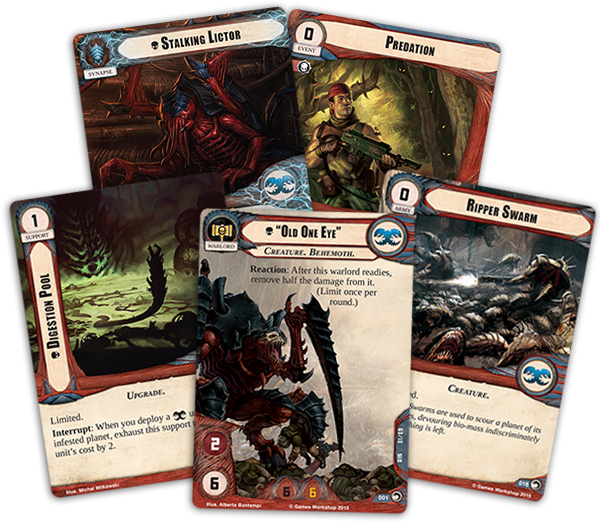 In this deluxe expansion, each of the seven factions introduced in the Core Set gains six new cards (three copies each of two distinct cards), including an entirely new unique unit and another card to help you battle the Tyranids. 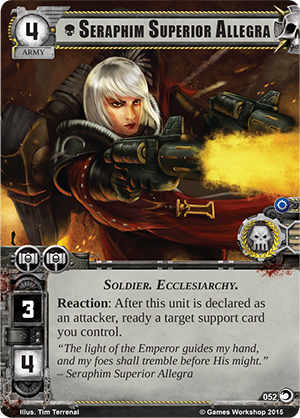 You may take brutal vengeance on the Tyranids with the Deathwatch Space Marines or fight alongside Seraphim Superior Allegra (The Great Devourer, 52) of the Adepta Sororitas. 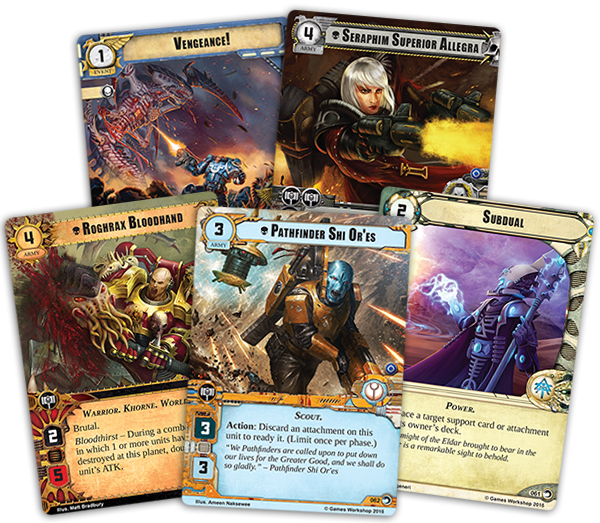 Whether you want to command an Eldar Autarch or a Chaos Space Marine of the World Eaters, these new cards help you go toe-to-toe with the Tyranid attackers and survive. To combat the Tyranid threat, every faction will need their most powerful warriors and most cunning tactics. 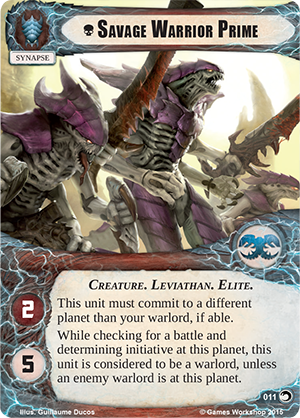 The Tyranid threat has traveled across the endless light-years of space to reach the Traxis sector… and they have arrived hungrier than ever before. Will you lead these hordes of ravening monsters across the planets, or will you be one of the fearless few who dares to take up arms and battle this threat? Choose your side, and prepare for your battles to change forever with The Great Devourer expansion for Warhammer 40,000: Conquest! Look for The Great Devourer at your local retailer in the second quarter of 2015!